Federal funds rate and capacity utilization in manufacturing. 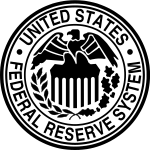 The Federal Reserve uses open market operations to influence the supply of money in the U.S. economy to make the federal funds effective rate follow the federal funds target rate. Financial Institutions are obligated by law to maintain certain levels of reserves, either as reserves with the Fed or as vault cash. The level of these reserves is determined by the outstanding assets and liabilities of each depository institution, as well as by the Fed itself, but is typically 10% of the total value of the bank's demand accounts (depending on bank size). In the range of $9.3 million to $43.9 million, for transaction deposits (checking accounts, NOWs, and other deposits that can be used to make payments) the reserve requirement in 2007-2008 was 3 percent of the end-of-the-day daily average amount held over a two-week period. Transaction deposits over $43.9 million held at the same depository institution carried a 10 percent reserve requirement. The nominal rate is a target set by the governors of the Federal Reserve, which they enforce by open market operations and adjusting the interest paid on required and excess reserve balances. That nominal rate is almost always what is meant by the media referring to the Federal Reserve "changing interest rates." The actual federal funds rate generally lies within a range of that target rate, as the Federal Reserve cannot set an exact value through open market operations. The Federal Reserve has responded to a potential slow-down by lowering the target federal funds rate during recessions and other periods of lower growth. In fact, the Committee's lowering has recently predated recessions, in order to stimulate the economy and cushion the fall. Reducing the Fed Funds Rate makes money cheaper, allowing an influx of credit into the economy through all types of loans. Bill Gross of PIMCO suggested that in the prior 15 years ending in 2007, in each instance where the fed funds rate was higher than the nominal GDP growth rate, assets such as stocks and/or housing fell. ↑ "Fedpoints: Federal Funds". Federal Reserve Bank of New York. August 2007. Retrieved 2 October 2011. ↑ "The Implementation of Monetary Policy". The Federal Reserve System: Purposes & Functions (PDF). Washington, D.C.: Federal Reserve Board. 24 August 2011. p. 4. Retrieved 2 October 2011. ↑ "Monetary Policy, Open Market Operations". Federal Reserve Bank. 2008-01-30. Retrieved 2008-01-30. ↑ "Reserve Requirements". Board of Governors of The Federal Reserve System. December 16, 2015. ↑ "Fed funds rate". Bankrate, Inc. March 2016. ↑ Cheryl L. Edwards (November 1997). Gerard Sinzdak. "Open Market Operations in the 1990s" (PDF). Federal Reserve Bulletin (PDF). ↑ "BBA LIBOR - Frequently asked questions". British Bankers' Association. March 21, 2006. Archived from the original on 2007-02-16. ↑ "4:56 p.m. US-Closing Stocks". Associated Press. December 16, 2008. 1 2 "Historical Changes of the Target Federal Funds and Discount Rates, 1971 to present". New York Federal Reserve Branch. February 19, 2010. Archived from the original on December 21, 2008. ↑ "Effective Federal Funds Rate". Federal Reserve Bank of St. Louis. Retrieved 2016-03-07. ↑ David Waring (2008-02-19). "An Explanation of How The Fed Moves Interest Rates". InformedTrades.com. Archived from the original on 2015-05-05. Retrieved 2009-07-20. 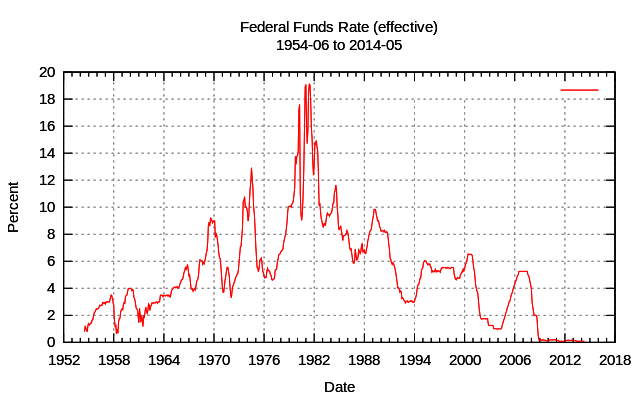 ↑ "$SPX 1990-06-12 1992-10-04 (rate drop chart)". StockCharts.com. ↑ "$SPX 1992-08-04 1995-03-01 (rate rise chart)". StockCharts.com. ↑ "$SPX 1995-01-01 1997-01-01 (rate drop chart)". StockCharts.com. ↑ "$SPX 1996-12-01 1998-10-17 (rate drop chart)". StockCharts.com. ↑ "$SPX 1998-09-17 2000-06-16 (rate rise chart)". StockCharts.com. ↑ "$SPX 2000-04-16 2002-01-01 (rate drop chart)". StockCharts.com. ↑ "$SPX 2002-01-01 2003-07-25 (rate drop chart)". StockCharts.com. ↑ "$SPX 2003-06-25 2006-06-29 (rate rise chart)". StockCharts.com. ↑ "$SPX 2006-06-29 2008-06-01 (rate drop chart)". StockCharts.com. ↑ "Press Release". Board of Governors of The Federal Reserve System. December 16, 2008. ↑ "Open Market Operations". Board of Governors of The Federal Reserve System. December 16, 2015. ↑ Shaw, Richard (January 7, 2007). "The Bond Yield Curve as an Economic Crystal Ball". Retrieved 3 April 2011.